Friday, as we all know, is Valentine's Day. I honestly don't have very much planned. I tend not to get wrapped up in the holidays (that is a product of my year-round years....I was always off-track for the major holidays!) But I do have three Valentine's Day mini-projects planned. Of course, the students will pass out valentines to their classmates. 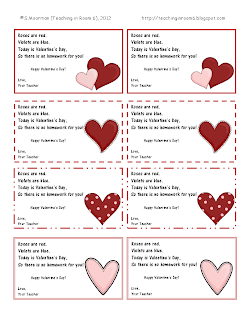 I am not into spending a ton, so I made these Valentine's Day Homework passes. I know my kids will love them, and they didn't cost me a dime :) Win-win! Feel free to print out a copy for yourself. The download includes a "Love, Your Teacher" AND a blank one for you to sign, or just keep as is! We are beginning our study of solid shapes, including surface area. 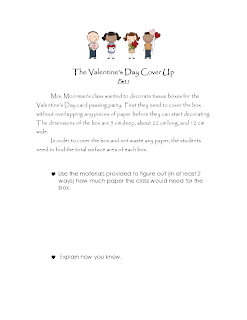 I am going to have the students do an introduction concept lesson on this skill, using Valentine's Day as my hook. The students will have to figure out how much wrapping paper will be needed to cover their valentine box. The basic idea of the concept lesson is to allow the students to explore this big concept of surface area without a formal lesson. It is to give them a chance to discover for themselves what the big idea of the skill is before I simply tell them. So for this lesson, the students will be given a box, and some tissue paper (the wrapping paper), as well as a ruler, scissors, pencil and paper. The will be asked to figure out EXACTLY how much paper is needed to cover the box with no overlap. This is a HARD lesson, but doable. The students will struggle, but there are some ways they can figure it all out. They will be frustrated, but if they use some of the problem solving skills they have, they should be able to tackle this. It is "backwards" from the normal teaching, but that is the idea. I want them to see what they can do before I simply tell them. It helps them to internalize the idea before I just give them an algorithm. This is what I did with the fraction concept lesson and the students are all the better for it. Though, as a teacher, it is really, really tough to see the kids get frustrated. It makes me frustrated. However, the end result is worth it. I will report back and let you know how it goes! Thanks! I bought my kids glowstick bracelets (100 for $10) on Amazon and putting "you make my heart glow". Got idea from pinterest!!!! Love your passes. Please send me a copy with Love, Mrs. Campbell. I follow your blog and facebook. Tamara, do you have another email address? I can't get this one to work :( It keeps coming back to me. Love this! Thanks for the freebie and what a great idea. I love your things! Always clever and practical. Of course I follow both your blog and FB. Your blog is amazing!! Thanks so much for your wonderful ideas! I don't have a Facebook page, so I downloaded the passes, skipped to Scrappin' Doodles and then did a little recreating. Your passes are cuter, but I got mine done--thanks to your inspiration! I like to start with some sort of problem solving activity too, so they can try to work through the process and understand what is actually going on. Usually someone happens on something worth discussing with the whole class. Then they have background knowledge for learning the specific mathematical processes. Awesome idea about the box! It really is a great way to get the thinking about the process of math. I find that it helps too with the questions in other subjects. They are more apt to figure things out and problem solve for themselves if I am not always giving them the answers! Thanks! For the homework passes. It will save me checking papers!! Pat, would you like the customizable ones? I can't find your email address on the blogs. Thanks for your generosity. I follow you on both! Hi, I have been watching your site for some time now. I just want to say as a new teacher your site has helped me so much! I am long term subbing (hoping for a full time job soon!) and your ideas are great and creative. I am so happy to hear that Katie! Anything I can do to make that career beginning easier :) It is such a hard time...boy do I remember that! Mme F-B (Madame Ferguson-Brown), as it's quite a mouthful in English, let alone French! Great work with these! Thank you so much for the freebie! Happy Valentines Day to you! Thanks for sharing your homework passes. I know my students will love them. I would love a personalized copy. My kiddos will love it. I also would LOVE LOVE LOVE my name on the homework pass. OK...I have sent them all out. :) I am off to bed. Happy Valentine's Day everyone! Ok, so I just found this on Pinterest and was wondering if you could personalize it for me for this year!